← The 30 Day Challenge – WHY A THEME? You made it midway! Congratulations! I hope you are feeeeeling The Muchness!!! Kinda strange that looking for Muchness, though inspiring and happy-making, can actually get tiring. Or annoying, or dull…. Right? Only feeling crappy is supposed to make us feel like that. But that’s why The Muchness Challenge is just that- A Challenge!!! What you are doing is actually changing a habit. Good or bad, habit changing can be tough. And annoying. And tedious. But when you stick with it, the payoff is worth it! 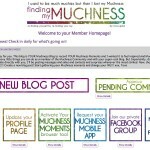 Clearly, reading through the topics in this group is a great place to start – but it’s important to know that there is nothing wrong with struggling to find the Muchness every day! That’s why you’re taking the challenge!!! And there is nothing wrong with INVENTING the Muchness. Really. Fake it. Stage a Muchness Moment for the camera. It doesn’t matter that it’s not real. You’re only job is to make it look real. The 30 Day Challenge- Reinforce the happy!! The 30 Day Challenge – WHY A THEME? Have you seen your new Member Homepage?!? !